Tswreis Guest Faculty Recruitment 2018 (TS Social Welfare): Telangana Social Welfare Residential Educational Institutions Society, Hyderabad invites applications from the eligible women candidates to work as Guest Faculty in TSW Residential Degree Colleges for women for the academic year 2018-19. Applications are invited from the eligible women candidates in the subjects of 1) Telugu 2) English 3) History 4) Economics 5) Political Science 6) Mathematics 7) Physics 8) Chemistry 9) Statistics 10) Computer Science 11) Botany 12) Zoology 13) Micro Biology 14) Commerce to work as Guest Faculty in TSW Residential Degree Colleges for women for the academic year 2018-19. TSWREIS - Guest Faculty (Last date to apply is 28.06.2018): Telangana Social Welfare Residential Educational Institutions Society, Hyderabad invites applications from the eligible women candidates to work as Guest Faculty in TSW Residential Degree Colleges for women for the academic year 2018-19. టీఎస్‌డబ్ల్యూ గురుకులాల్లో ఫ్యాకల్టీలు: తెలంగాణ సాంఘిక సంక్షేమ గురుకుల మహిళా డిగ్రీ కళాశాలల్లో వివిధ సబ్జెక్టుల్లో ఖాళీగా ఉన్న గెస్ట్ ఫ్యాకల్టీ పోస్టుల భర్తీకి టీఎస్‌డబ్ల్యూఆర్‌ఈఐఎస్ నోటిఫికేషన్ విడుదల చేసింది. అర్హత: సంబంధిత సబ్జెక్టుల్లో కనీసం 55 శాతం (ఎస్సీ/ఎస్టీ అభ్యర్థులు 50 శాతం) మార్కులతో మాస్టర్ డిగ్రీ (ఎంఏ, ఎమ్మెస్సీ, ఎంకాం) లేదా తత్సమాన పరీక్షలో ఉత్తీర్ణత. నెట్/స్లెట్, సెట్, ఎంఫిల్, పీహెచ్‌డీ ఉన్నవారికి ప్రాధాన్యం ఇస్తారు. తెలంగాణలోని పాతజిల్లాల ప్రకారం జోన్ 5, జోన్ 6లకు చెందిన మహిళా అభ్యర్థులు మాత్రమే అర్హులు. 2. Masters Degree (i.e., M.A/ M.Sc/ M.Com) with a minimum of 55% (50% in case of SC/ ST candidates) of marks in the relevant Subject is required. MCA/ M.Sc Computers/ M.Tech(CSE) in case of Computer Science subject. Additional qualifications like Ph.D/ NET/ SLET/ M.Phil will be preferred. Selection: Based on Written Test, Demonstration, Interviews, Additional qualifications. Last date for submission of application: 28.06.2018. Date of Written test: 01.07.2018. 3. A Masters Degree (i.e., M.A / M.Sc / M.Com) with a minimum of 55% (50% in case of SC/ST candidates) of marks in the relevant Subject is required. M.C.A / M.Sc Computers/M.Tech(CSE) in case of Computer Science subject. Additional qualifications like Ph.D / NET / SLET / M.Phil will be preferred. 5. Candidates with B.Tech qualifications with 60% of marks possessing exceptional abilities shall also be considered to engage classes in Computers subject. 7. The last date for submission of application is 28.06.2018 up to 12:00 a.m.
9. The written test will be conducted on 01.07.2018 i.e Sunday from 2:00 p.m. to 3:30 p.m. in the Telangana Social Welfare Residential institutions in Hyderabad. 10. The services of the selected candidates will be utilized purely on temporary basis during this academic year. 11. The remuneration payable is Rs.25,000/- per month depending on the work load in the subject concerned i.e., Number of periods to be engaged in a week by the selected candidates in the subject. 12. The candidates are informed to pay an amount of Rs.250/- (Rupees two hundred and fifty only) through online towards examination fee. 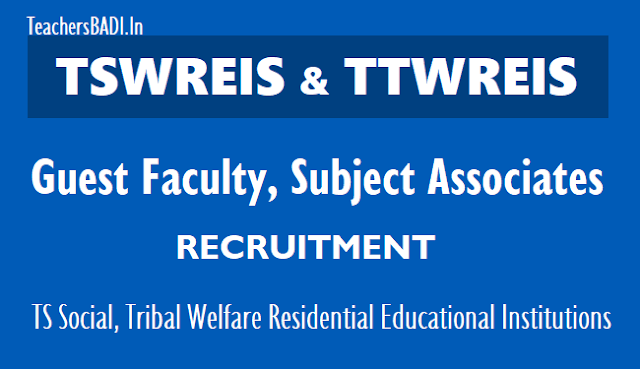 Tswreis, Ttwreis Guest Faculty /Subject Associates Recruitment 2018 inTS Social, Tribal Welfare Residential Educational Institutions: Selection of Part time Guest Faculty/ Subject Associates in COEs of TSWREIS & TTWREIS 2018: It is to inform that, TSWREI & TTWREI Societies have converted certain institutions in to COEs for providing quality coaching to the JEE Mains/Advanced and NEET aspects to the children of poor families. In this regard senior subject faculty and subject Associates (Academic Assistant) @ 5 to each institution are required to work in the following COEs in Telangana State. Subject Associates Recruitment Exam on May 17, 2018.